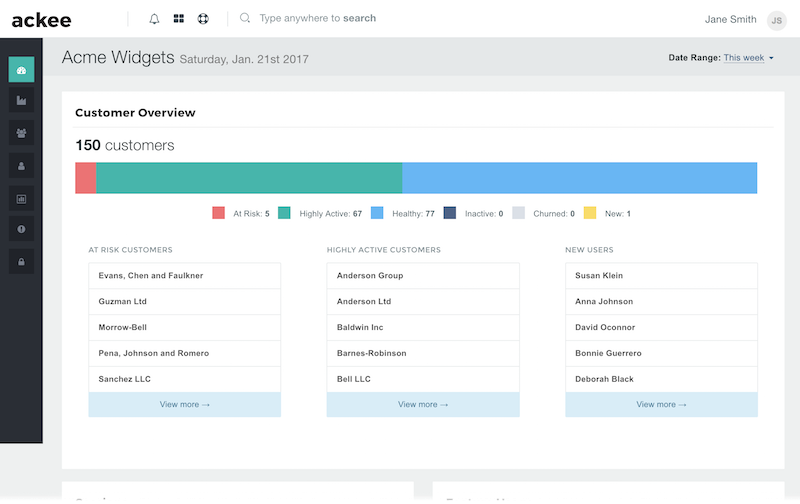 Ackee streamlines your customer success workflows, helping you save time, drive adoption and build real customer value. Get insights into the individual needs of your clients, using in-depth health metrics powered by real customer activity. Unify your data with our integration library, and put detailed customer info at your fingertips in a beautiful, easy to use dashboard. Gain instant visibility on the highest risk and most active accounts in your customer base, and focus on the clients that need your attention the most. © 2016-2018 Ackee Digital Enterprises, Inc.